Western Cape based learner, Junaid Opperman from De Rust Hoërskool, won the Oxford University Press Southern Africa commemorative “My Education, My Future” national artwork and creative writing stamp design competition at an awards ceremony held in Pretoria today, 8 December 2015. The winning artwork was unveiled by the Minister of Telecommunications and Postal Services, Dr Siyabonga Cwele and the Minister of Basic Education, Mrs Angie Motshekga. 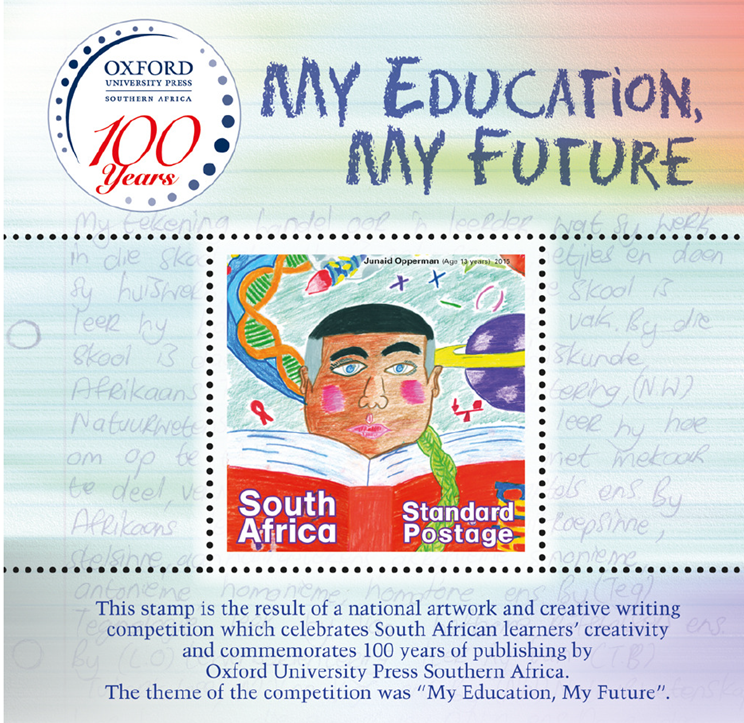 The competition was initiated by leading South African educational publisher Oxford University Press, in partnership with the Department of Telecommunications and Postal Services, the Department of Basic Education and the South African Post Office, to commemorate Oxford’s 100 years’ celebrations. “We recognise the power of education to uplift individuals and communities. 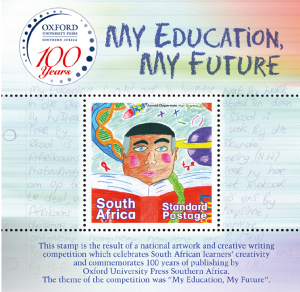 We have already donated 20 000 dictionaries with our ‘Every Child Deserves a Dictionary’ campaign earlier this year but we also wanted to commemorate the occasion by having a centenary stamp developed, involving and rewarding school learners in South Africa,” said Oxford University Press Southern Africa, Managing Director Steve Cilliers. “It is rewarding to end this special year on such a high note. Reviewing the artwork and reading the creative writing entries was very encouraging as the aspirations of our youth is a true inspiration for the future of our country,” added Cilliers. A total of 90 schools participated in this educational artwork and creative writing project for the development of the centenary stamp, with 1800 learners taking part. The awards ceremony was attended by a few of the finalists who were awarded certificates, Oxford educational resources as well as educational success hampers. The rest of the 56 winners will receive their prizes at provincial prize-giving ceremonies in the new school year and all of the 23 schools that produced the winning entries will receive a book donation for their library. “There was no hesitation to be involved as this is a great initiative where the role of the Postal Sector, particularly the Post Office, in education is highlighted through stamp design and creative writing by learners from quintile one and two schools. Stamps are a critical component of the postal sector across the globe and are generally referred to as “the country’s smallest ambassador” as they travel across the globe and carry with them a message about the country throughout the national and international postal system. We believe that the learners were the biggest beneficiaries of this initiative,” said Department of Telecommunications and Postal Services Minister, Siyabonga Cwele. “The initiative supports the DBE’s key focus areas with regard to the improvement of literacy through improving reading and writing skills; the provision of Learner Teacher Support Material and school library resources; learner wellbeing and the promotion of a holistic school environment through the use of art and creative writing. The competition extended to all provinces with the DBE selecting the top ten quintile one and two schools per province that performed the best in the 2014 Grade 9 Annual National Assessments,” added Mrs Angie Motshekga, Minister of Basic Education. “We were pleased to see the quality of the stamp designs received from learners participating in this competition. Involving South African school learners in creating the artwork for this stamp provided a good opportunity for them to contribute to the creation of a memorable stamp,” added SAPO Acting Group Chief Executive Officer, Trevor Ndlazi. The centenary stamp will be available in January 2016 nationally at select South African Post Offices and on www.virtualpostoffice.co.za.